Alcohol e-CheckUpToGo: eCHUG is an interactive web survey that allows you to enter information about your drinking patterns and receive feedback about your use of alcohol. It has been proven to reduce alcohol consumption. Automatic External Defibrillator (AED) System: An AED is available in each SDSU Police Department vehicle and at various locations on campus. Defibrillation within 3 minutes of the onset of a heart attack saves 7 out of 10 lives. Learn more. Campus Safety and Security Report: SDSU is required to to report annual crime statistics, provide timely warnings of serious crimes when there may be a threat to others, and to keep a public log of campus incidents. You may find this information in the Campus Safety and Security Report (PDF). Counseling and psychological safety: if at any time your son or daughter is struggling with a psychological emergency, Counseling & Psychological Services will provide a professional today to speak with him or her, in person or by phone. Crime, how to report: See the SDSU Police Department page titled How to Report an Emergency or Crime. Emergency Alert System: Parents and family members may subscribe to SDSU's Emergency Alert System to receive a text or an email in the event of a campuswide emergency or health and safety concern. Emergency phone locations: The SDSU Police Department maintains around 100 “blue-light” emergency/duress phones throughout the campus. The phones provide immediate access to Police Department Dispatch (no need to dial 9-1-1). Learn more. Emergency phone numbers: Visit SDSU's Emergency Preparedness website. Emergency preparedness: SDSU has established emergency preparedness, response, and recovery guidelines for students, faculty, staff, and others so the effects of campus emergency situations can be minimized. 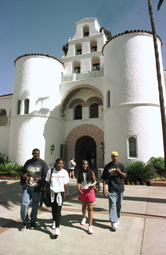 Visit SDSU's Emergency Preparedness website to learn more. Environmental Health and Safety: The department of Environmental Health and Safety (EH&S) at SDSU ensures compliance with local, state and federal statutes and regulations pertaining to health, safety and environmental protection. EH&S is a department of the division of Business and Financial Affairs.